Home Blog General What Causes Weakness in Dogs? In the span of your dog’s long and healthy life, it’s not uncommon for there to be moments of lethargy and discomfort. It can be tough to witness your dog experiencing weakness especially when you haven’t identified a cause. 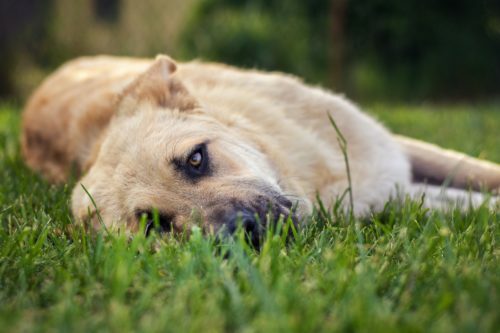 Though most cases of dog lethargy and weakness can be quickly identified, when it comes to chronic and increased weakness over time, there may be a more serious underlying problem at hand. There can be a number of issues causing your dog to feel and act physically weak. These range from temporary and acute to more serious and chronic problems that can be fatal. The two most common issues affecting the strength and development of dogs are infection and disease. Infection can play a major role in overall canine weakness and fatigue. These infections generally produce weakness alongside additional symptoms. Some of the most common infections that affect dogs are heartworm disease, kennel cough, and canine distemper. Heartworm disease, or dirofilariasis, is caused by a blood-borne parasite that can be found in the heart of your dog through way of mosquito bites. The symptoms can include lethargy and muscle weakness paired with fever. Treatment of heartworm disease includes a series of medications prescribed by the veterinarian. Another common and highly contagious infection is Kennel cough. Kennel cough is an upper respiratory infection which is generally contracted at places of high density with other infected animals. The symptoms of kennel cough include muscle weakness, fatigue, and fever and the treatment includes cough suppressants and antibiotics. Viral infection, Distemper, is another common infection that affects canine lymphatic tissue and includes symptoms such as weakness, fatigue, and discharge from the eyes and nose. Treatments for distemper usually include antibiotics and fluids. There are many types of diseases that can affect the strength and energy levels of dogs. The two most common diseases that result in dog weakness are Myasthenia Gravis and Congenital Myasthenia Gravis. Classified as an autoimmune disease, Myasthenia Gravis is the weakness or fatigue related to a dog’s skeletal muscles. This can be relatively intermittent, coming and going in waves, or it can be more chronic and lasting. When physical weakness is intermittent, it often is aggravated by activity (such as walking, running, and playing) and relieved by rest. There is a miscommunication that occurs in Myasthenia Gravis between your dog’s nerves and skeletal muscles, relaying to the muscle related pain and suffering. Due to the discord between the delivery of impulses between nerves and muscles, your dog’s muscles contract improperly which causes weakness. Generally occurring between ages 1 and 4, Myasthenia Gravis is an acquired disease. There are three subcategories for Myasthenia Gravis including mild, involving one body part, moderate, involving limbs, and severe, which is generally fatal. Congenital Myasthenia Gravis, on the other hand, occurs at birth and is seen in puppies with a lack of acetylcholine receptors on their muscles. Though there is no known treatment to Myasthenia Gravis, there are many available medications that can help your dog maintain the quality of life. Fatigue and muscle weakness in dogs can have a number of different associated symptoms and signs to look for. One of the most common symptoms is immediate fatigue after minimal exercise. A few other symptoms to watch for include an unusual gait, body tremors, shaking, excessive drooling, and heavy breathing. When observing your dog, try to notice if any other symptoms are present alongside the fatigue. Is there discharge? Does your dog have a fever? Is there vomiting or abdominal pain? Looking at the history of your dog’s health can also provide some insight into what the cause may be. Muscle weakness in dogs can be exceedingly debilitating and difficult to pinpoint. The causes can include infection, disease, illness, and overall malaise. In most cases, a quick veterinarian exam will determine the specific cause of your dog’s weakness. Often times, it can be helpful to maintain notes and a chart of when the symptoms started, severity, and what medications your dog may be taking. If you have any concerns, a good rule of thumb is to always consult a veterinarian with any concerns or symptoms your dog may have. Remember, when caught early, many diseases and infections can be treated.